Shocking fact: I don’t love shopping. In fact, I find it burdensome. When I need a new pair of jeans or shoes I often put off my shopping trip for far too long because, well, not only is it a pain to find time to go out to the mall or wherever, but there just seems to be so much pressure to find the right pair. The same goes for technology, household items and more. I researched cameras for weeks when mine was stolen, and have been putting off buying new bath mats for our master bath for months. I wish the perfect item would just show up on my front door so I wouldn’t have to spend so much time searching for it. Now, don’t get me wrong, I love having new things – it’s always fun to add to your wardrobe or upgrade your camera, etc. But I don’t just go browsing department stores for fun (now, Target, I suppose, is another story – I run in for diapers and end up with a cart full of things I didn’t know I needed until I laid eyes upon them – ha). 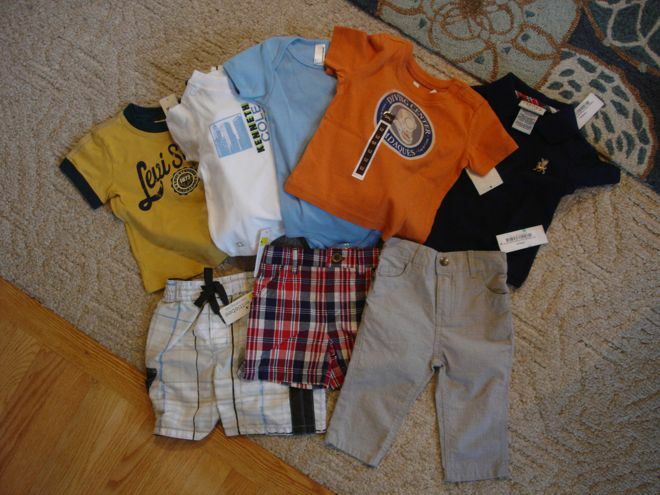 When it comes to baby clothes, I’ve been lucky so far — Corban spent his first six months or so in mostly gifts, and my mom is an avid deal snagger who has been outfitting him in cute “pre-owned” apparel from the start. I’ve been mostly spared the task of going out shopping for baby clothes thanks to that, and to a little service called Wittlebee. 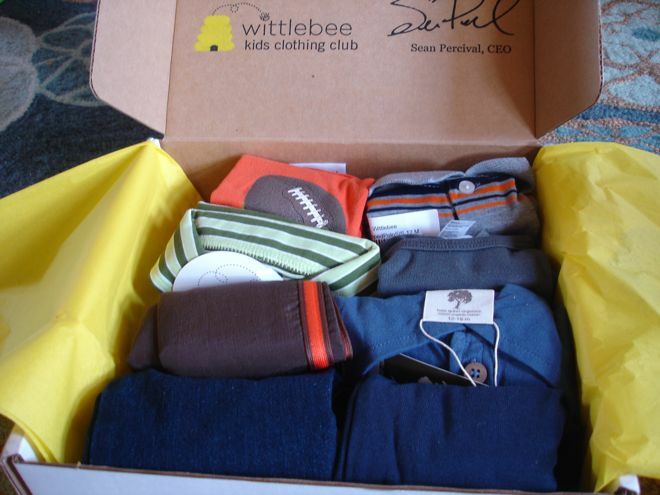 Wittlebee is a baby clothing service that sends you a monthly box of baby clothes, allowing you to choose sizes, style preferences and clothing needs, but giving their “stylists” the freedom to choose the exact items from name brands like American Apparel, Kenneth Cole Reaction, Carters and Calvin Klein. Someone to pick out cute clothes and send them to me? Yes, please. Before they send you a box, a stylist calls to confirm your order and take any preferences on items. I meant to cancel or at least take a break after the second box, but of course I failed to answer the phone or return the call or update my style profile online before the third box was sent, so we received another filled with pants, long sleeve shirts and onesies in 12-18 month sizes. Corban probably didn’t need more clothes at that point, but I can’t complain because it was totally my fault for not canceling, and the clothes are all cute. The Wittlebee website says boxes come with six items, but the three boxes I’ve gotten have all come with eight. That makes the $40 price tag a decent deal – $5 per item – considering it’s all new clothing and from brands that aren’t exactly cheap (all three boxes came with at least one American Apparel onesie, which retails for $11.50 — a price I’d never pay, by the way, but it is a great onesie). We took a break this month because we’re good on fall clothes, but I will probably say yes to a box here and there in the future. 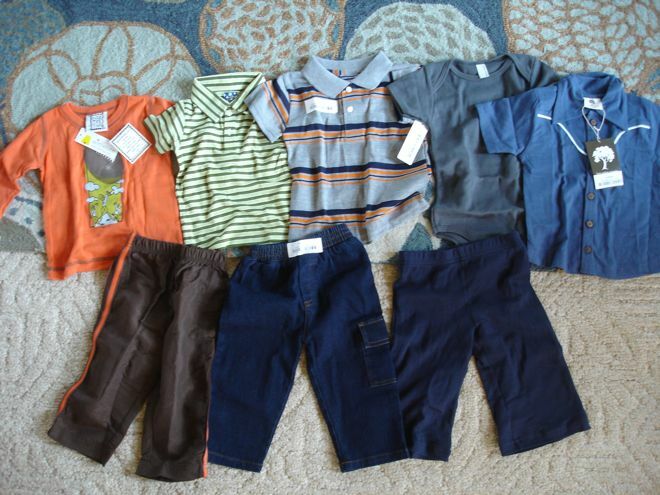 I’m all for a good steal from a rummage sale or resale shop, and that will still be where many of Corban’s clothes come from, but it’s nice to have some new, high quality items too. And for someone like me who would rather have someone else pick out and deliver clothes to my door, Wittlebee is perfect. Have you used any sort of home delivery “club” for baby things? We subscribed to Honest Company diapers for two months with a really great coupon (50% off), but stopped when the price went back to normal. I’m all for these kinds of things, but only if they’re a good deal!